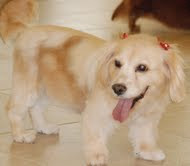 "Cookie is my senior cocker spaniel/dachshund mix rescued a few years ago. Just over a year ago, she had a malignant mammary tumor removed and it was suggested that she have chemotherapy immediately thereafter so it wouldn't come back. Instead, I did some research for alternatives, found Ask Ariel, and then decided to try the OncoPet and Immune Harmony cancer package. It is obvious that Cookie's health only got better from that point on and I am grateful to Susan Davis for her advice and fabulous products! Cookie also benefits from Phosphatidyl Serine for her Cushing's Disease, Amazing Omegas, and Power Probiotic. Thanks also to the Ask Ariel team for superb customer service and fabulous bonus gifts. It is clear that you all care very much about your customers and their furbabies! Thanks again!!" Gina Berardino Florida 2011Click here to view all of Ask Ariel's holistic supplements for cancer. By far, the best results we have seen in cancer patients has been when the pet owner was able to catch the cancer early (as a result of regular laboratory testing) AND when a combination of both conventional and holistic medicine is used. While holistic veterinary medicine cannot cure cancer, it can make a tremendous difference. It is unfortunate that many times, people don’t discover the wonders of giving their pets the best nutrition and supplements until their pet has been diagnosed with a serious illness. The best way to help prevent cancer is to start at the beginning of your pet’s life, giving them optimal nutrition, vitamins, Omega 3s and building a sound immune system. But, even if your pet has been recently diagnosed with a life-threatening illness, it is not too late to make important changes that can give you more time. It is analogous to the advertisements you might have heard about lung cancer and that it is never too late to stop smoking! One misconception that can be misleading for pet owners is that there is not “one” diet or “one” set of nutritional supplements for a pet with cancer. The reason is that cancer can have many forms, arising in different parts of the body which will affect the pet’s nutritional needs differently. All pets do need nutritious whole foods rich in Omega 3s, vegetables and some quality protein (varies depending upon the pet’s condition). Common sense should be the guiding factor in feeding your pet. Be sure to avoid giving your pet anything with artificial colors, sweeteners or preservatives. Never give animal fat such as chicken skin or fat from a piece of steak for example. Avoid foods made from simple carbohydrates such as biscuits, bread or crackers. Use caution with protein--giving your pet endless amounts of protein is not advisable, everything should be in balance as in some cases (e.g. if the pet has a liver condition) too much protein can be harmful. We strongly urge you to seek the advice of a veterinary professional for dietary advice. Telephone consultations are available at Ask Ariel if you would like assistance in developing a home made diet and determining a holistic plan for your pet with cancer. Squamous Cell Carcinoma – Cancer that occurs in the mouth, underneath the tongue or along the gums of the middle-aged and older cats. Common signs of squamous cell carcinoma in cats includes difficulty eating, interest in food but not wanting to eat, drooling and odor from the mouth. Osteosarcoma -- Osteosarcoma is the most common type of bone tumor in dogs. Osteosarcoma beings in the bone but can spread throughout the bloodstream very early in the course of the disease (metastasis). The most common areas for this cancer to appear are the wrist, shoulder, knee and hip. The first sign of bone cancer is lameness due to pain from the cancer. Swelling often occurs at the tumor site. When selecting products specifically for your pet’s cancer, be sure to check whether the products are deemed safe to use during chemotherapy and/or radiation if your pet is undergoing treatment. Good manufacturers will have researched this issue carefully and will advise you. For example, OncoPet Cancer Vitamin and Regeneration Cancer Formula (dogs only) are two formulas that have been used extensively with cancer patients undergoing chemotherapy and radiation. We also offer a premium, comprehensive Pet Cancer Supplement Package that includes our two cancer selections: Immune Harmony (great for autoimmune, cancer and allergy conditions) and OncoPet Cancer Vitamin (broad based cancer support). There is no question that we have seen by far the best results when patients use a combination of both conventional and holistic veterinary medicine when treating their pets with cancer. Regardless of the treatment protocol, a nutritious diet and some carefully selected supplements can only help to strengthen the pet and keep them feeling more comfortable. Research and education are key, as well as working with your veterinarian and other veterinary professionals to ensure that your pet is receiving all of the treatment alternatives possible—both conventional and holistic.